News of the strike from the Daily Mirror of 28 December 1918. As the first world war drew to a close, there was an explosion of industrial militancy in some unlikely sectors of the economy. Even hairdressers downed scissors and curling tongs in pursuit of a better deal on pay. There had been minor disputes with local federations representing mostly small employers in the industry for some years. Early in 1917, Glasgow hairdressers won a minimum wage of 28 shillings a week, and Belfast hairdressers came out on strike for a similar deal. But it was London that saw the most significant confrontation, when hairdressers in the National Amalgamated Union of Shop Assistants, Warehousemen and Clerks drew up a comprehensive charter covering both pay, working hours and the role of shop stewards. 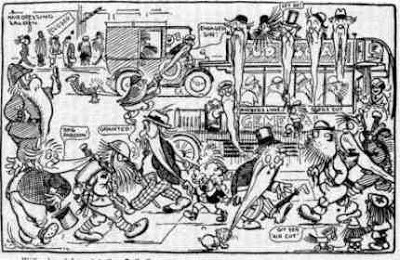 Widespread negotiations in the West End of London beginning at the end of 1917 resulted in 20 firms adopting the charter, which laid down a 48-hour week. A short strike at Faulkner’s Saloons, which operated at a number of railway stations brought another significant employer into line in January 1918. And in June, Harrods Stores, with 71 hairdressing employees also signed up. However, 12 months of negotiations with three separate employers’ federations on a London-wide deal made little progress, with the employers holding out for a 56-hour week and the right to fine employees who arrived late for work. In December 1918, the shop assistants’ union decided to submit an across-the-board pay claim of 10 shillings a week in all London saloons where there were members. The claim went in to 46 employers. When employers at the more heavily unionised West End and City saloons procrastinated and started taking steps to smash the union by dismissing its stewards, 277 hairdressers downed tools and walked out. The strike was a tremendous success. 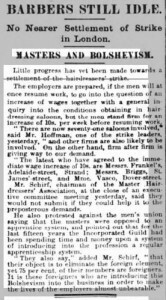 As salons caved in one by one, their employees returned to work, and the union brought out its members in other locations; blacklegs bussed in to break the strike were swiftly recruited by the union and also joined the picket lines. Even Fleet Street was sympathetic. The Daily Mail called it “the polite strike” while cartoonists had a field day. 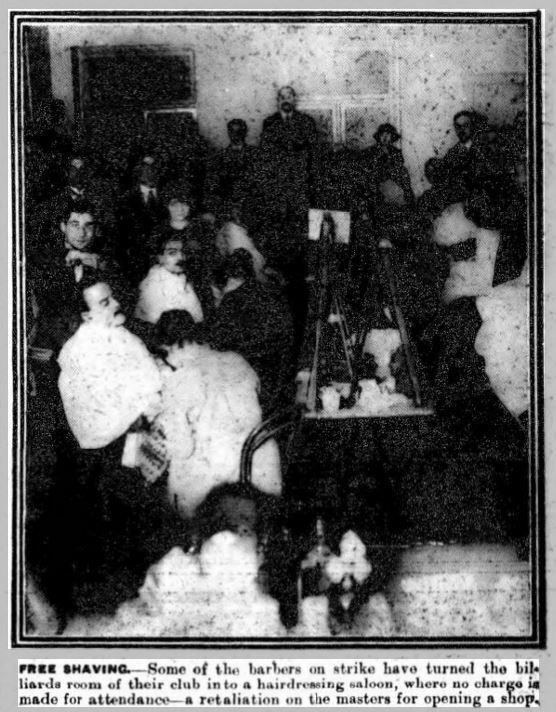 When employers donned aprons and joined forces to try to break the strike at Shipwright’s, the largest salon in the West End, the union organised the hairiest men it could find on the capital’s streets to queue for a cut and shave. Meanwhile, the assistants opened their own salon, and fashionable London flocked to have its hair cut and nails manicured. Peers, generals, music hall stars and even the prime minister of Australia came through their doors. 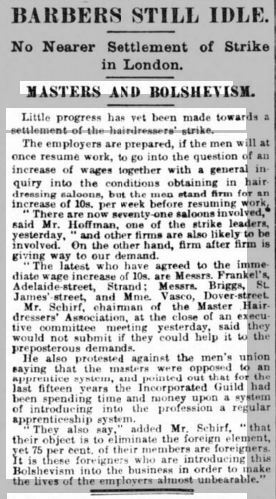 By mid February, talks facilitated by the Ministry of Labour had produced a temporary deal to raise commissions, and after seven weeks on strike, the hairdressers returned to work. A final settlement saw 46 employers raise wages by the 10 shillings the union had first sought. Among them were Bond Street firms including Hills, Trufitts and Douglas. A further 20 firms settled at a slightly lesser rate. By any measure, the strike had been a great victory.